Skills you need to succeed in a digital world + our BEST tips! As you know, the world is more digital than ever before, and more and more people are hoping to build their own business and make it online. 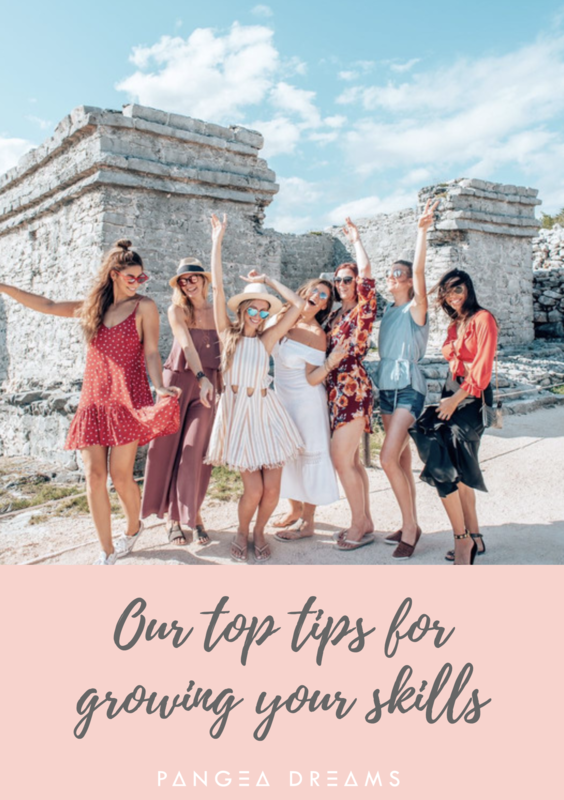 Whether you hope to become a travel writer, a professional photographer or a DIY blogger, you need to be online, and you need to have certain skills in order to make it. Gone are the days of relying on fliers, word-of-mouth and a physical store-front. Everything is online today. You are probably even guilty of googling what florist is best in your area, and picking the one that has the best-looking website, the most followers on Instagram, or the best reviews on their Facebook page. Keeping this in mind, our retreats focus on teaching digital skills that will help you succeed with building a brand and business online today. And we aren’t the only ones who have realised the importance of them, which is made clear by a simple scroll through websites like Elite Daily and Forbes. But what exactly are these skills everyone seems to be raving about? What do you actually need to know and get good at in order to succeed? This post has your back! In addition to sharing the top set of skills you need in order to succeed in this digital world, we are sharing a FREE download with our best tips for each skill! Simply scroll down to the bottom of the post and sign up to the email list! Marketing isn’t what it used to be. Naturally, social media is now a huge part of a business that used to be all about billboards and posters. Now, everything we need is found online. Therefore, most of our marketing tactics need to happen online as well. The new kind of marketing, as opposed to a classic style of marketing, is hard to grasp and get used to – but once the skill is learned it’s so valuable. The focus today is on taking yourself less seriously, and being comfortable with promoting yourself as a brand and as a person. Something that felt super uncomfortable 10 years ago is now spread all over Instagram with a simple #ShamelessPlug. Learning to confidently take on and get used to this kind of self-promotion (and accepting that it isn’t bragging or ‘salesy’, as long as you are being you) is incredibly important these days. Who would have thought that these two ‘personality traits’ would become necessary skills to have in order to succeed in business one day? Well, they have, and they are quite important. Building a personal brand is all about opening up and allowing your followers to get to know who you really are. This is part of what makes today’s way of building a business so special! Being relatable will help build your tribe in a way like never before, as your audience will know that you share their problems and insecurities, and also their tastes and preferences. This way, their trust will lead to new opportunities and chances for growth for you! These are highly important ‘skills’ to have today. Networking has changed completely in the face of the digital world. Going to events and handing out business cards is not as common as before, as everything is going on online. Using online platforms well and getting your brand across in the right way is key here, and so is understanding the art of engagement. The latter is not just a strategy for Instagram growth anymore, but a new and complete form of networking. Everyone you ever wanted to meet can be ‘met’ online, and this brings with it a whole new set of rules and etiquette. We are not saying you need to know how to build an App or re-code your whole website. But you do need some tech skills in order to move forward, even if it’s just formatting the headings on your website. By knowing how to do the simple things related to your website, online store or blog, you are eliminating lots of frustration for your audience (nobody likes 404 pages), and money spent on expensive web designers. Have you ever heard the saying “everybody hates millennials until they have to change a PDF file to a Word document”? Well, it’s time to prove it to be true. Being able and willing to adapt to change is vital in order to grow a business today. It’s important to understand that everything is changing faster than ever these days, and that you need to be open for change in order to continue growing. Having a flexible approach and an open mindset will set you up for whatever the world throws your way, whether that’s a sudden shadow ban or an algorithm change. So be prepared to go with the flow and respond quickly to whatever challenges you come across. Flexibility is a key skill to hone as your brand and business grows, and is what will set you aside from the rest. WANT OUR BEST TIPS RELATED TO THESE SKILLS? Thanks for this post! Even though I am a millenial, the tech side of blogging is definitely not my strong suit! Thanks for sharing this! I’m in the works of creating my own online design business, so this post was very helpful to me! Totally makes sense to me! The going live part is the hardest one for me. Kinda getting out of my comfort zone.